The audio market, these days, is flooded with digital to analogue converters, there must be hundreds with more appearing each month. In this crowded market it is hard to produce a DAC with a unique selling point as they all use a limited range of DAC chips and the supporting technology. RT Audio Design, based in Sofia, Bulgaria, have used some design features that whilst not unique are rare. 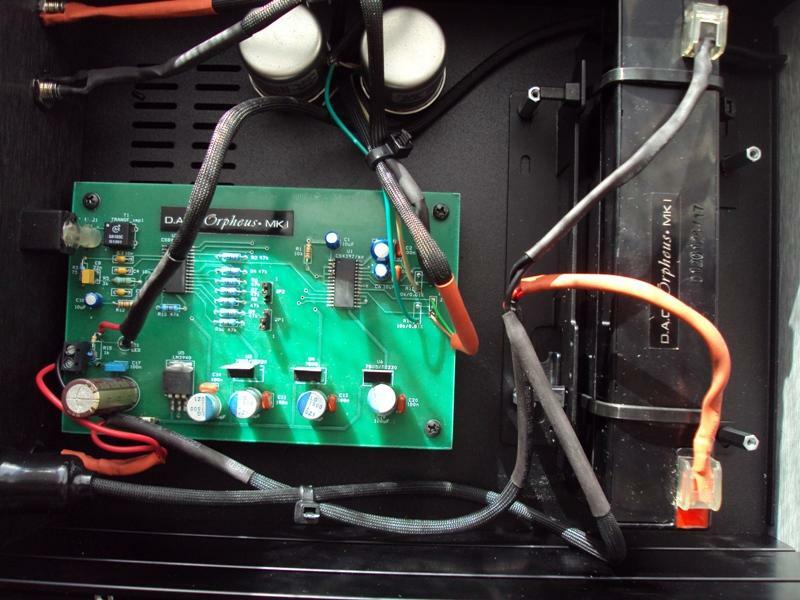 The Orpheus mk1 uses a battery power supply and transformers to connect the DAC to the outside world. At 750 euros the Orpheus mk1 uses a CS4397 DAC chip to provide 24bit, 192Kkz conversion from a single SPDIF input. The output uses regular RCA phonos, but as I said earlier fed from transformers. These days having just SPDIF as the input seems a significant restriction, if you have a PC source with just USB for the audio output you will have a problem. You could go old school and use a CD transport as the source, I chose to use a PC with SPDIF built into the motherboard and running Audiophile Linux v3. Inside view of the Orpheus mk1 showing the battery on the right and output transformers at the top. The combination of the PC running Audiophile Linux and the Orpheus mk1 DAC work well together. The only small issue I noticed was a hiss on the output from the DAC when the PC was not working. The noise from the DAC vanished as soon as the PC was booted up and ready to play music. If you want to know more about Audiophile Linux read the review by Nick Whetstone that you can find here. All my music sits on a network storage device (NAS), with the PC suitably configured. As I am not a Linux wizard configuring the PC to find the music on the NAS was painful but thanks to Google I was able to find the answers. In my limited experience Audiophile Linux makes a very good media player but you do need some Linux experience to get it working in the way you want. To evaluate this DAC I used my Eryk S Concept Superioro single full range driver speakers with some parallel single ended EL84 valve amplifiers from "My Sound", a new brand from Poland. To give a more dynamic balance I also used another new amplifier from Virtue Audio in California, the Violet, a battery powered class D amplifier using a chipset from International Rectifier. 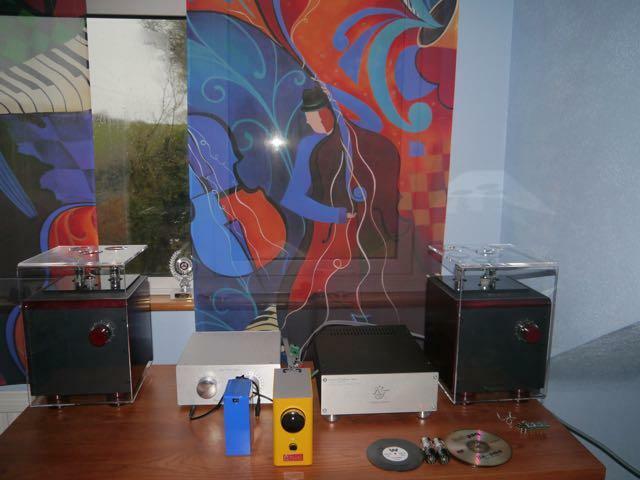 The Orpheus mk1 DAC alongside Virtue Audio Violet (Yellow) and My Sound monoblock amplifiers. I even managed a session completely off mains power using a 12v Lithium Polymer battery to power the PC. Using the battery for the PC had little impact on the sound, and as it only lasted 45mins, I quickly reverted back to the mains power. First impressions with the Orpheus mk1 DAC are the high levels of transparency and detail. With the lack of output filters, and just the transformers connecting the DAC to the rest of the system, there is little added colour to the sound. My regular DAC, the La Voce, also has a simple output stage, but does have coupling capacitors so you do do get some colouration in comparison. The background is also extremely quiet, as you might expect, with a battery supply. Some might find this clarity, lack of colouration and super quiet background a bit soul-less. What this does is allow the character of the music to shine through. My regular reference recording of the Tallis Scholars performing Allegri's Miserere really does show this DAC off. 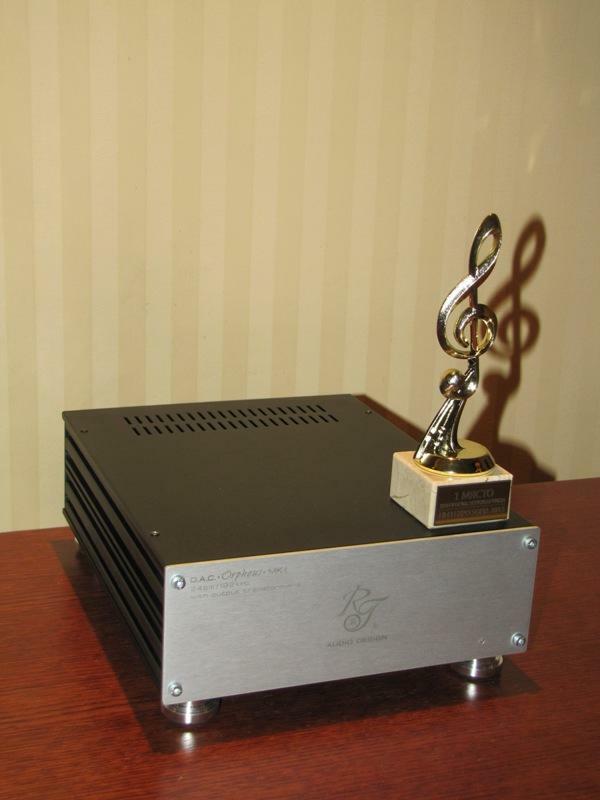 Other DACs I have reviewed, including my reference La Voce seem hazy in comparison to the Orpheus mk1. The Tallis Scholars are recorded in a church in London, I believe, with the microphones some distance from the singers, so there is a lot of recording venue ambience. The Orpheus mk1 lets you place the singers in the sound stage with much more accuracy than most other DACs. Changing musical style to something more dynamic, the Buenavista Social Club album has lots of percussion with off beat rhythms. This is a challenging album to reproduce and not ideal for the valve amps so I switched to the class D electronics. The extra power and speed of the Virtue Audio amplifier allowed the infectious beat to draw the listener in. The track "Dos Gardenias" has the Orphues mk1 displaying the vocal and muted trumpet solo in a natural, relaxed way, placed in a realistic sound stage. Turning to something a bit more up to date, "Liquid Spirit",the title track by Gregory Porter. Gregory is rendered with a rich and believable texture to his voice. So far the recordings have been my CD rips to WMA format, we must give the Orpheus mk1 the opportunity to see what it can do with something in a high resolution format. Turning to Diana Krall and the album "All for You" that is dedicated to Nat King Cole. The track "Boulevard of Broken Dreams" has Ms Krall in a relaxed and mellow mood. I find it difficult to justify the extra cost of the high resolution material as the differences can be small and some of the material is not as high resolution as the record companies claim. Diana Krall does come across in a more analogue style of presentation, the clarity, lack of colouration and background noise from the Orpheus mk1 really helps the quality recordings like that from Diana Krall to shine. In my collection I have some recordings from Katzenberger Music Productions, in a mixture of 96kHz and 192kHz WAV format. These recordings have no post production, what you hear is what was recorded with no messing. Through the Orpheus mk1 the recordings of jazz from Heinrich von Kalnein, Sebastian Gille, Henning Sieverts & Jonas Burgwinkel have a very analogue quality. The soundstage stretches way back from the speakers, this is not a sitting on your lap recording. The Orpheus mk1 is able to resolve the details that some DACs find hard, as the musicians are so far from the microphones. With these recordings, I did hit a small problem, I was unable to play 192kHz files. The 192kHz recordings did play but with a lot of hiss. I believe this is not a problem with the Orpheus mk1 DAC but with the SPDIF output on my PC. The PC is several years old so probably cannot manage the high data rates required by the 192kHz format. I have no reason to doubt the ability of the DAC to play 192kHz files, I just don't have a suitable source at the moment. These days, DACs are expected to come with multiple inputs and supporting numerous formats. The Orpheus mk1 goes against the trend, some may find this too much of a restriction. I thought the single input would be an issue, but in practice, with the right source, it works extremely well. What I have learnt is you don't need USB, good old SPDIF is just fine. The battery supply and transformer output give the Orpheus mk1 an edge over the masses and a sound quality that is much better than the average at the €750 price point. Some might find the Orpheus mk1 a little dry and lean sounding, for me this is the DAC adding nothing to mix, it just gives you what was in the recording and nothing more. The Orpheus mk1 from RT Audio Design is a DAC worth seeking out. The value for money is excellent as output transformers are not cheap plus the added complication of the battery and charging circuit. I look forward to hearing the mk3 version with with WM8740 DAC chip in place of the CS4397 and most importantly built in transformer volume control with balanced output option.